It was 62 years ago that US Rangers stormed the cliffs of Pointe Du Hoc near Omaha Beach. And as the veterans of that day grow oh so gray and bent, mere shadows of the lithe and limber youths who pulled themselves up the jagged bluffs, one hand over another, their comrades falling all about them, we are reminded that the word “courage” came alive that day. Too often, we use that word in a base and cavalier way. A Hollywood movie star has “courage” because she revealed to the world that she’s a drug addict. A comic has “courage” because he made fun of the President of the United States to his face. A filmaker has “courage” because he made millions of dollars shooting a “documentary” which shows the US government complicit in the mass murder on 9/11. And so instead of “courage” being a word with inexpressible significance and meaning beyond its simple definition, it has become a self congratulatory epithet, a hollowed out expression of empty promise and insincerity. Today, the purveyors of myth and shapers of opinion use the word to tell the rest of us who to admire and what to respect. No longer does courage imply sacrifice or a willingness to give all that one has for a cause greater than oneself. Instead, courage defines the selfish desires and overwrought egos of an ideology that sees more irony in the word than reverence. All of this was in the future 62 years ago when the Rangers lived the word courage by taking the bluffs above the beach. And a short distance away at Omaha, Americans were dying, never knowing that their sacrifice was redefining the word courage for all time. For in their last bloody moments on earth, a titanic struggle was taking place between good and evil that 10,000 years from now, poets will still be singing songs and human beings will still be shaking their heads at in wonder and awestruck disbelief. It takes genuine courage to confront evil. By its very nature, evil must defend itself by lashing out and destroying anything that attempts to get in its path, lest it perish ignominiously. Those representing good realize this which makes the confrontation between good and evil always a life threatening proposition and thus, an exercise in self-denial and sacrifice. The Rangers on the bluffs and the men in transports speeding toward bloody Omaha that terrible day 62 years ago knew full well what they were in for. They were willing to pay the price to defeat evil. 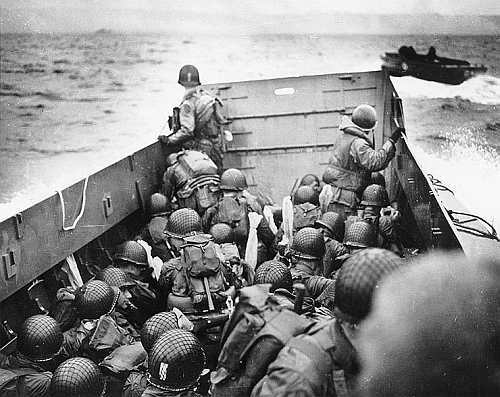 There were more than 700 war ships on the waters of Normandy that day, firepower never before seen on the open ocean. The men would be landing with tanks and guns and grenades and enough explosives to blow up a small town. But their most potent weapon by far was the courage to face their foes in open combat with the full knowledge that doing so was likely to get them killed. We ask ourselves quite properly, would I have been capable of such a feat? The answer will likely tell us much about ourselves. Because in those last frantic minutes before hitting the beach, as grown men wept and prayed and steeled themselves for the supreme test of their young lives, they must have found something deep within themselves, something they could mentally and emotionally grasp and hold onto so real and palpable it must have been. What was it? An image of their family? A remembrance of love and closeness that wrapped itself around them and made them feel safe? Or perhaps it was the simple recognition of the here and now with a sublime faith that He that arbitrates our fate has placed me in His keeping and if these be my last moments, let them be meaningful ones. They were getting butchered where they were all the sea wall because the Germans had it all zeroed in with their mortars that were coming down on top of them. And, “Over here, Captain,” “Over here, Lieutenant, over here.” A sergeant looked at this situation and said, “The hell with this. If I’m going to get killed, I’m going to take some Germans with me.” And he would call out, “Follow me,” and up he would start. Hitler didn’t believe this was ever possible. Hitler was certain that the soft, effeminate children of democracy could never become soldiers. Hitler was certain that the Nazi youth would always outfight the Boy Scouts, and Hitler was wrong. “Unknown but to God” and history, I suspect. In the end, whatever gave them the inner strength to keep going in the face of such murderous opposition, it was as inspirational then as it is today. It is fitting and proper that we remember their courage today, the young men who lived and died the word courage. But we must also question ourselves about our commitment to that memory. Does it have meaning beyond the misty eyed reminisces of old men? Can we still summon forth the will to perform great deeds in a cause that reaches far beyond our narrow little corner of planet earth in which we live and love and die? At the moment, the answer to that last question is unknown. But I daresay the fate of the nation rests upon a positive response. For unless we are willing to propel ourselves beyond our own selfish, comfortable existence and find the strength to confront the evil that seeks to destroy us, we are more likely to end up a victim of our own hubris rather than triumphant with the knowledge that we, like the men of D-Day, brought to life the word courage and made it once again something to be lived and felt in our hearts, ever mindful of the sacrifice of those who came before us. I visited Normandy last year. The steepness of the climb from the beach is surprising. It’s a nice beach, no real sign down there on the sand of what happened. And even if you know what happened there it’s hard to see it. It’s the graveyard at the top of the bluff that brings it home. My kids wanted to play in the sand and surf and my first instinct was that it would be almost sacrilegious. But then it occurred to me that the little part-Jewish American boy and the Chinese-American girl playing on the beach was a pretty good symbol of what those great men had died to preserve. A powerful remembrance. Such courage, indeed. It makes one feel quite small and weak to imagine what these men did in our name. As to your final question — “Can we still summon forth the will to perform great deeds in a cause that reaches far beyond our narrow little corner of planet earth in which we live and love and die?” — I’ve thought for a while now that the answer to such a question is…no. We are a house divided, and our children learn nothing of liberty in their public schools. Few could even tell you what D-Day is, and they’ve been taught to believe that it’s entirely reasonable for some to question whether the Holocaust ever even occurred. The newest rage in social studies education (my own daughter went through it this year) is to study WWII from the Nazis’ perspective, because they were victims, too, you know. No oppressors; just victims all around. Whatever shared values we once had as a nation have been replaced by the twin ideologies of multiculturalism and cultural relativism. There is no more “evil” in the world, just “another way.” Our children have been taught good and well that the promotion of democracy or liberty or freedom or whatever you want to call it is simple, petty imperialism, and that people living under tyrants prefer that to any interference by Western principles. This country can’t come together and even identify a common enemy let alone fight one. We aren’t victims of hubris, as you say, but rather ignorance. So, no, we will not rise up again to confront tyranny. We’ll embrace the tyranny, think it was our own great idea, applaud its commitment to “the people,” and then stand around naked, shivering, and impotent as it drives us into the ground, wondering how in the hell it all came to this and thanking God our grandfathers aren’t around to see it. Victor Mangano. May God rest his soul! What a load. No one is teaching history where Nazis are victims. They may be teaching it with a perspective that includes the GErman point of view. Not synonymous. As for summoning courage, what are the soldiers, Marines, airmen and sailors in Afghanistan and Iraq? Cowards? Nicely said Rick, thank you! soldiers who showed the world what COURAGE is. Nanci Oteri noted a cousin who died in Europe. On checking, it was good to see that 2nd Lt. Victor P. Mangano of Cambridge, Mass. is listed in the records of the World War II Memorial. And thanks to all of his family for his selfless service. Everyone who has a relative who served in WWII should be sure that relative is honored by placing their name in the Memorial database. The web site is http://www.wwiimemorial.com. It brought a sense of pride and gratitude when I visited the WWII Memorial on the Washington Mall and my father’s service was noted for all to see. Thanks, Dad.